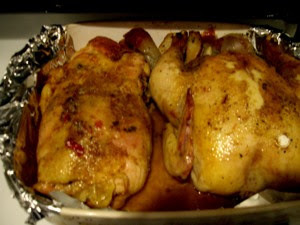 I love to long roast chicken - you must haver discovered! And it gets even better when you can filet a chicken in bone piece and remove the bones. Then you can make a roulade filled with different ingedients. To filet a chicken, you need a very sharp boning knife and a pair of strong kitchen scissors. You start with incisitions along the breast bones, and let the knife follow the ribs, around the bird. Try not to punctuate the skin, as it s nice for the roulade to be whole, in order to let the filling remain in the middle. To remove the thighs, break the to parts of the leg and press out the bones. It is the easiest with the lower chicken leg, and more difficult with the upper ones. Make an incision to get under the bones and cut along the leg in order to get it out. The joints themselves may be difficult to get out. Then the rest of the recipe. Roll out boneless chicken, skinside down. In parts where there are most skin and less meat, fill inn taboulleh and cheddar cheese. Roll chicken into a roulade. Fasten string around the roulade for it to keep its shape. Rub inn seasoning. Place in pan with onions, and allow to roast in oven 100C / 210F for 4 hours. Pour over liquid every hour. Last hour every quarter of an hour. After 4 hours. Pour over Tabasco sauce. Increase heat to 200c / 400-425F, and bake until crisp. Serve with rice and steamed haricot verts.